Clipstone Camp near Mansfield in Nottinghamshire was a very large military training camp established during the First World War. Thousands of men went there to train before going off to fight for King and Country. Their future was unknown and many would not return. 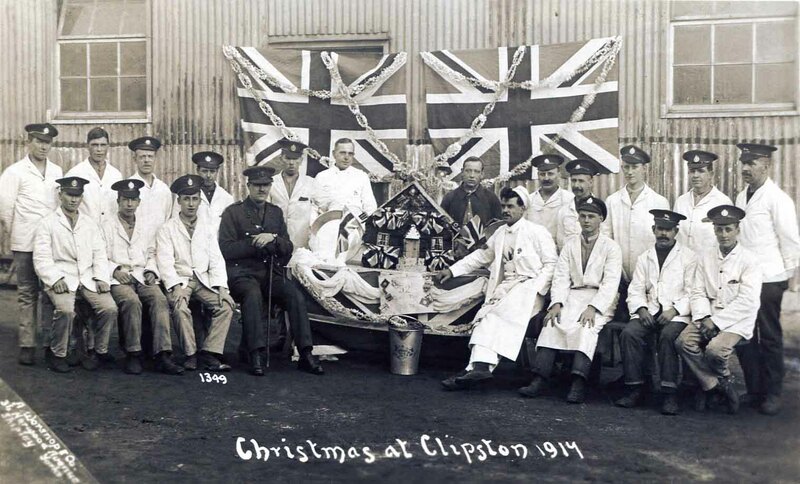 The welfare of the men was of up most importance during their time at Clipstone with concerts and other activities taking place both at the camp and in the surrounding town and villages. 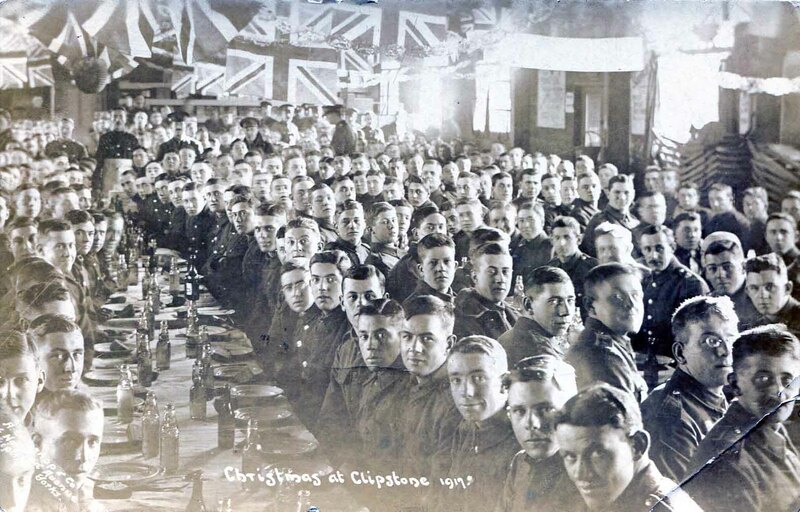 I have the counterpart postcard (a picture taken from the right hand side of the dining hall at the same Christmas Lunch) in which my Grandfather can be seen. My grandfather was in the Rifle Brigade and served in France in 1917 and 1918. I will provide a copy of the picture to the administrator of this site. It would be nice to think that our respective Grandfathers who were comrades and who were at this lunch together nearly 100 years ago have the event preserved for future generations to see. I have this same postcard (the lower one) as my grandfather is in it. He sent it to his mother who was looking after his children (including my mother). He is the man on the lower right with the moustache sitting next to the chap with the glasses. On his postcard he put on the back “This is not very flattering of me, is it”. He was in the Essex Regiment originally but was transferred to the Herts Reg in about 1916 when he went to Clipstone. I believe he was an instructor on the Lewis Gun and was fortunate never to see active service, which may have been partly due to role as a trainer and/or his age and/or the fact that he was a single parent to two young children.